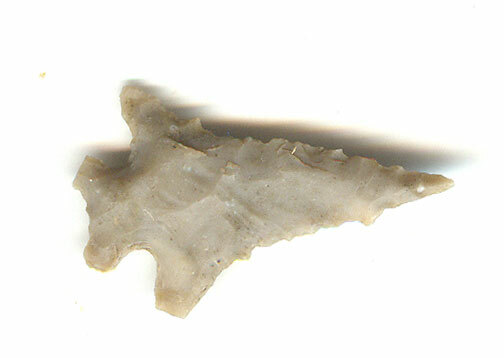 A Medium Size, Visibly Aged And Anciently Aged Typically Made, Slightly Serrated, Steiner Arrow Point That Exhibits Surface Oxidation And Stone Aging Coloration Patination, Aging In The Corner Notching, Aged Surface Soil And Caliche Deposits, Correct Overall Style Flaking, Deep Aged Stained Hinge Deposits, Correct Material And Manufacture For The Area Found. Found By Ralph Nicholas In Morris County, Texas Near Lake O the Pines. Ex-Ralph Nicholas, Billy Dixon And Kevin Farmer Collections. This Is A Typical Example, Displaying Age And Ancient Use Wear Being In Good Condition. Includes A Ken Partain Certificate Of Authenticity.